ACL surgery recovery aims to strengthen the knee and ensure it regains full stability to allow people to return to their normal activity levels prior to their ACL injury. When the rehab process is followed correctly, over 90% of people state they feel they have regained full function in their knee. ACL surgery recovery will vary from person to person. There are different types of grafts used in ACL reconstructions, different surgical techniques and there are often other injuries associated that are repaired at the same time as the ACL. Healing rates vary and all of these will impact the rehab and recovery process. You can find out more in the ACL knee surgery section. Problems after ACL surgery are rare and usually short-lived. Here, we will look at an average ACL surgery recovery timeline following reconstruction of the ligament. This is intended as a guide and not a substitute for medical advice. Time frames specified are average guidelines only, everyone will progress at slightly different rates. You will be carefully monitored and evaluated by your surgeon and physio and should always talk to them before progressing any rehab or returning to any activities and follow their guidance at all times. If you want to find out more about specific exercises and activities for each phase, visit the ACL rehab protocol section. The ACL surgery recovery process actually begins before you have your operation. You will have a pre-op appointment with your surgeon where you will discuss what is going to happen in the operation such as what graft they are planning to use and talk through the expected recovery process. You should also see a physio who will go through rehab exercises for you to do in preparation for your operation. This is really important as increasing the strength and mobility of your knee before surgery can really positively influence your ACL surgery recovery. ACL reconstruction surgery is usually done a few weeks after your initial injury. This is to allow time for the swelling to go down, for you to regain full range of movement and build up the strength of your leg muscles. Surgery usually takes 1-2 hours after which you will be taken to the recovery room for approximately 2-3 hours. You may be allowed home later that day or the following day, most likely with a pair of crutches. You can find out more about what happens during surgery in the ACL reconstruction surgery section. e) Knee Brace:Different surgeons have differing opinions on the use of knee braces as part of ACL surgery recovery. Follow the advice of your surgeon. You are usually allowed to place as much weight through the leg as is comfortable (unless direct otherwise by your surgeon). If needed, you will be given crutches for comfort for the first few days. When you feel ready you can progress to using just one crutch (in the opposite arm to your operated leg) and eventually wean off the crutches altogether. If your injury has been more serious and there has been associated damage and therefore more complex surgery, you may be non-weight bearing initially. This will slow down the ACL surgery recovery process slightly. The first 2 weeks of ACL surgery recovery concentrates on regaining full range of movement at the knee, particularly extension (i.e. being able to fully straighten the knee). Flexion (bending) the knee, tends to be easier to regain. You will work on a rehab programme with your physio which you need to do daily. During weeks 2-6 on the ACL surgery recovery timeline, emphasis shifts to strengthening and stability. Your physio will give you a range of strengthening exercises to target the quads, hamstrings and glutes as well as proprioception exercises. With proprioceptive exercises, you are working on regaining the awareness of the position of your knee and leg. This is done by re-educating the knee with balance exercises. The ACL plays a vital role in proprioception – you can read more about that here. Care should also be taken in this phase of the donor graft site while that is healing. You may be able to return to work during this phase but it will depend on the nature of your job – discuss this with your physical therapist or surgeon. a) Swimming: You can usually start swimming in this phase, but you need to start with front crawl. Breast stroke should not be done until you are at least 4 months post-op. 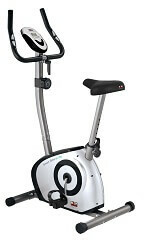 b) Cycling: start by using a static bike, gradually building up the resistance. c) Running: start by jogging at up to 40% of your normal pace. You want to avoid changing direction initially so make sure you are running in a straight line on even ground. Your physio will guide you on how to progress from here. 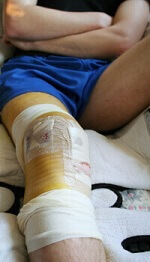 Phase four on the ACL surgery recovery timeline is all about preparing to return to sports. Your physio will work on specific rehab exercises and sports drills appropriate to your aims and anticipated sporting activities. This will include high level balance and proprioceptive exercises to ensure you regain full stability of your knee before returning to sports. People often feel frustrated in this phase of ACL surgery recovery as their knee may feel “normal” but it is not quite ready for the stresses and strains from sporting activities. The final stage on the ACL surgery recovery timeline is returning to contact sports such as rugby and soccer. This should always be discussed with your physical therapist and agreed with them to ensure you are ready. It is a long time to wait, but research has shown that is important to wait until now to ensure the long term success of the operation. There are differing opinions over the use of knee braces as part of ACL surgery recovery. Some surgeons will want you to wear a brace either just initially or longer term, others won’t. There is little clinical evidence that wearing a knee brace reduces the risk of re-injury however it can help with proprioception and may help increase confidence. Discuss this with your surgeon and physio. Remember, everyone is different, and this is just a guide. Don't get downhearted because things are taking longer than you had hoped. Follow the advice of your physio and make sure you stick to your personal rehab programme. Ninety percent of people get back to full function following surgery so be encouraged. You can find out about the most common issues after surgery in the Problems After ACL Surgery section. For guidance on suitable exercises during each phase of ACL surgery recovery, visit the ACL rehab section. Or, to find out more about ACL injuries, how they happen and how to prevent them, visit the ACL knee injury section.